Needless to say, I was beyond ecstatic when I saw the trailer for Love Never Dies during the previews for The Phantom of The Opera, which is the sequel to POTO. I was so excited I nearly squealed aloud with utter delight at even the thought of getting the chance to have a peek inside the Phantom's world for just one moment more, and I was even more excited when I found out that the American cinema's would be showing the Australian production of Love Never Dies on the Big Screen the following year only a couple of weeks after my 23rd birthday on May 23rd. 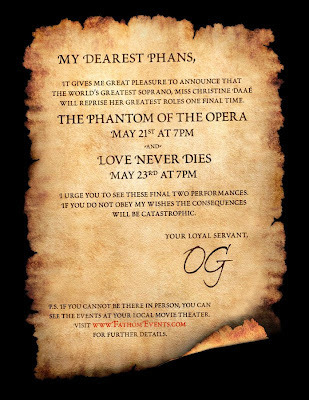 See, The Phantom himself has instructed me to go see the performance of Love Never Dies on May 23rd at 7pm. If I do not obey his wishes the consequences will be catastrophic. So, without further ado, I am going to see Love Never Dies this Wednesday with my love, as per Erik's strict instruction. Nothing could keep this Phantom Phan (ahem "Angel of Music") from attending this auspicious musical occasion, for one must certainly support the arts and watch the Phantom live on, right!? Click HERE to see if there's a Fathom Events showing of Love Never Dies playing in your area. I'm obsessed with this soundtrack. Truly I am. I got it for my 23rd birthday with the iTunes money that I procured from the parentals and I cannot wait to hear the musical scores drift through the theatre air this Wednesday, the 23rd! I plan on getting chills and crying all over again, yes, again. If you'd like to learn more about the Love Never Dies Story & The Musical Phenomenon check out the website ^^ above. Are you a fellow Phantom Phan? 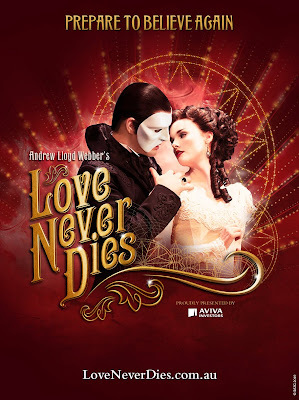 Will you be going to see Love Never Dies this Wednesday evening too? What are your fave songs from the Love Never Dies sountrack? Oh man, I just love Andrew Loyd Webber!! The POTO movie they made in 2004 is just about my fave thing ever. I sing the songs allllll the time too! Haha! 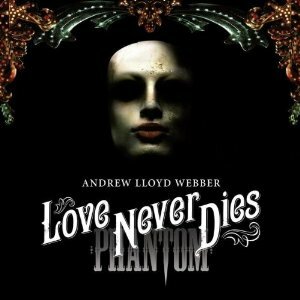 I haven't seen Love Never Dies, but I've heard some of the songs which are, of course, beautiful. Have fun seeing it! Girl, you totally need to see the 25th Live Anniversary edition of POTO! You will literally D.I.E. when you hear Ramin Karimloo and Sierra Boggess sing as The Phantom and Christine. I'm pretty sure that Ramin is my favorite Phantom ever, even though I do love Gerard Butler as The Phantom in the 2004 movie version of the musical. Seriouly, though, watch the live musical version from Albert Hall and you will be stunned! I have to admit, even if Love Never Dies isn't casting Ramin and Sierra (my favourites <3) , it's a great musical. But you can't help comparing the two musicals and sigh at LND. Miracles only happen once. Oh, yes, I so love love love Ramin (& Sierra) too! I try not to compare LND to POTO because really, you just can't. They are so unique in contrast as far as setting, music and story is concerned, and they do stand alone all by themselves quite fine, at least I think so.